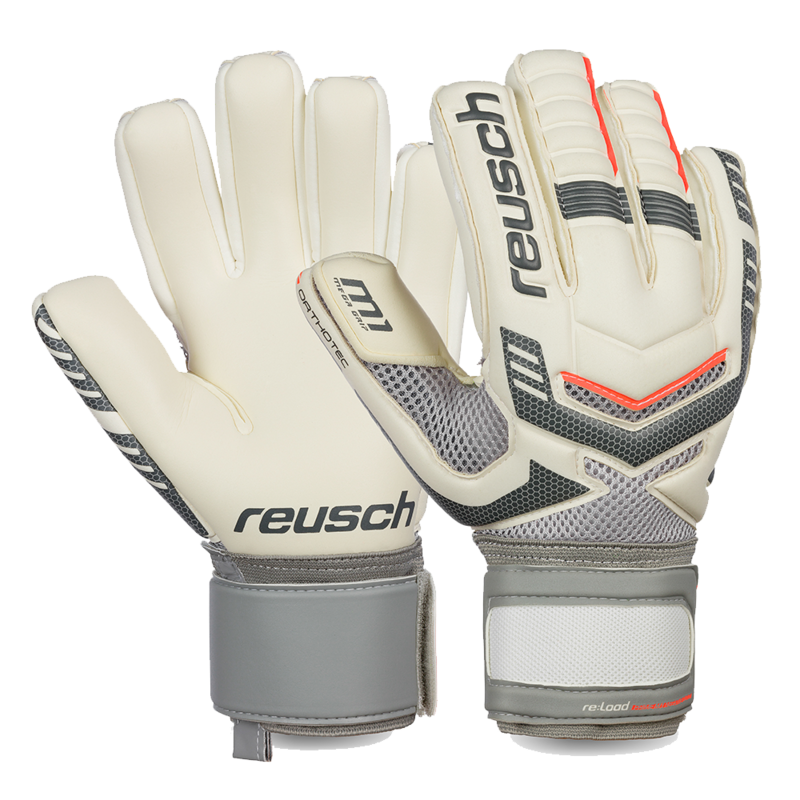 The Reusch Re:Load Prime M1 Negative Cut Ortho-Tec features a negative cut with finger protection for those goalkeepers who prefer a snug fit. The M1 latex provides a good balance of grip and durability in a game glove. Reusch used Super Soft/PU foam all over the backhand for a more comfortbale goalie glove. The new stretchable P.U. backhand material makes for more flexibility for the hand and an even tighter, more comfortanle fit for this goalie glove. Rolled Thumb Construction. AirVentSystem uses highly breathable Air Mesh material to make this glove more comfortable. The deep thumb notch on the face of the glove includes an elasticized piece below the foam to help eliminate tear out. Reusch also uses an elasticized thread throughout the glove to help eliminate tear out in all areas of the glove. Side mesh vents keep the goalkeepers hands cooler during use by allowing more airflow. Includes Thumbflex for more comfort and flexibility. Reusch have implemented a Surround Cut with negative seams. This special cut allows for 100% of the M1 latex on all points of contact with the ball. This cut is paired with the new Backhand Side Wrap, which wraps the backhand material around the side of the hand. This feature gives extra protection to the palm material and the side of the keepers hand. Game glove for premier, high school and college goalkeepers. Best used in all conditions when the palm is kept damp. I have trained with these gloves 4 times and played in 1 friendly so far and the grip is fantastic. They have only been used on artificial grass surfaces and they are already starting to wear. I am not surprised though as these are meant to be a soft ground glove. They do require a light washing after each game in warm water, but this is typically required if you want gloves to last. The orho-technology works well as you still have enough flexibility in your fingers to maintain an absorptive/soft touch on the ball, while protecting yourself from any future broken fingers or torn ligaments. I would recommend these to anyone who is looking for high level glove with ortho/finger save technology.